The upper extremity is first discretely visible as a bulge or limb bud that develops on the ventrolateral wall of the embryo on day 26 (4-mm crown-to-rump length) (see image below). The limb bud develops from the Wolff crest and lies opposite the 5 lower cervical and 2 upper thoracic segments. At this stage, the limb bud appears as little more than a mesenchymal core covered by a thin layer of epithelium. Developing embryo at 28 days, 40 days, and 46 days. However, experiments demonstrate that even at this early stage, cells are already polarized in some sense and carry positional information. The actual regulation of the process of outgrowth is discussed in Positioning, Regulation, and Patterning of Limb Development. Early in limb outgrowth, a thickening develops along the ventromedial border of the limb bud. This entity is termed the apical ectodermal ridge (AER) and is vital in axis orientation, outgrowth, and digitation. Seyfer et al demonstrated that this is not an apical cap, but an oblong marginal structure thickest at the limb apex. It is 2-5 cells thick and covers a layer of undifferentiated, proliferating mesenchymal cells 5-15 cells thick. This underlying layer, known as the progress zone (PZ), is also essential in limb outgrowth. The AER and PZ are intimately associated with a large marginal blood vessel, the marginal sinus, which branches at the base of the limb bud and reconstitutes to join the cardinal vein. The AER and PZ work as a functional unit responsible for the outgrowth of the limb along the proximodistal axis, and the marginal blood vessel may convey messenger proteins that integrate this process. The limb bud continues to grow outward from the ventral wall, and at day 32 it develops a somewhat flattened, paddle-shaped hand plate (8-mm crown-to-rump length). During the fifth week, differentiating mesenchymal cells condense in a proximal-to-distal fashion to form blastemas, which eventually develop into cartilaginous models of, ultimately, the bones of the upper extremity. At this time, nerve ingrowth from the rami of the spinal cord also occurs proximally. By day 41, the mesenchyme condenses within the hand plate to delineate digital rays, beginning with the border rays. During the sixth week, hyaline cartilage models of the proximal bones of the extremity are formed. In the seventh week, the upper extremity continues outgrowth and rotates 90° so that the elbows project posteriorly and the developing hands lie on the anterior thorax. At this time, the cartilaginous models of the proximal bones are undergoing ossification at ossification centers within the diaphysis of each model. Mesenchymal cells derived from the dermomyotome condense within connective tissue (mesenchymal) scaffolds to form 2 common muscle masses. They are immediately penetrated by the spinal nerves. These dorsal and ventral common muscle masses split later to form the muscles of the extensor and flexor compartments, respectively. The process of developing digits continues as the AER begins to fragment and notched digital rays are, thus, formed by day 46. At 50 days, the digits are webbed, and at 52 days (week 8, 23-mm crown-to-rump length), they have become separate digits. The process of forming separate digits involves the fragmentation of the AER and subsequent apoptosis, which involves programmed cell death (apoptosis) within the digital interspaces. The end of the eighth week marks the end of the embryonic period and the beginning of the fetal period. Anatomically, the fetal period is signified by vascular penetration of the humerus. Most of the morphologic differentiation of the limb occurs during the embryonic period; the most critical period for the development of anomalies is from 24-36 days. However, ossification and growth proceeds throughout the fetal period. The common muscle masses also continue to separate into individual muscles during this period, and the joints cavitate and become functional. At birth, the limb is fully formed. All that remains is the eventual ossification of the epiphysis and carpal bones and the completion of myelinization of the nerves. In summary, a brief timetable of hand development (modified from Tickle  ) illustrates the surprisingly rapid development of the refined upper extremity. To grow an appendage, an organism must overcome fundamental problems. First, the appendage must be positioned appropriately on the body. An appendage must be located so that it can relate to the main body of the organism and to other appendages to smoothly carry out its given functions. Second, the appendage must undergo outgrowth. In doing so, the appendage establishes its differential growth in relation to 3 axes. Lastly, the appendage must be shaped, and it must develop its functional components. The processes of outgrowth, axes establishment, and limb patterning are inextricably interwoven via a complex regulatory process. The process of limb formation relies heavily on the strict regulation of differential growth. Genes encoding outgrowth are highly conserved and are called homeotic genes. They lie in a defined order that corresponds to the topographic and temporal sequence of their expression along the outgrowing upper extremity. In humans, these are the HOXA and HOXD genes. They are colinear, and their ordering reflects their temporospatial sequence of expression. In developmental terms, the human upper limb is divided into the zeugopod, the stylopod, and the autopod, corresponding approximately to the arm, forearm, and hand, respectively. This tripartite structure is ancient and was even expressed, in a primitive form, in certain Devonian sarcopterygian fish. In 2006, the Devonian "fishapod," Tiktaalik roseae was discovered in the Canadian Arctic; at 375 million years old, it represents the earliest example of this structure. 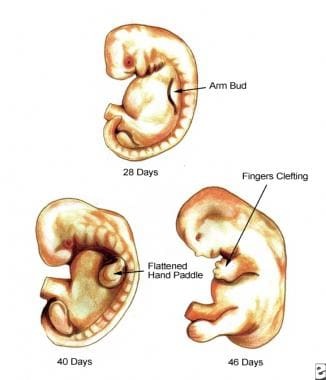 The development of the chick embryo exhibits this tripartite structure with 3 morphologically discrete digits, making it a popular model of limb development. In the first phase of limb development, HOXD9 and HOXD10 are primarily expressed as the zeugopod develops. In phase II, development progresses distally into the stylopod, and HOXD11, HOXD12, and HOXD13 expression dominate. With the development of digits and the autopod, HOXD13 expression becomes dominant. As development progresses down the limb, the HOXD genes are expressed in successive overlapping fields, wherein each dominant wave of expression gives way to the next, consistent with the colinear ordering of the genes (HOXD9 to HOXD13). The HOXA genes are expressed sequentially in a similar way but demonstrate less of an anteroposterior gradient than the expressed HOXD genes. This system of orderly, integrated genetic regulation is the current basis of our understanding of the regulation of upper limb development. This nested process of expression is sometimes referred to as a developmental cascade, a term that implies the concept that expression of just a few proteins may result in multiple subsequent events. The first problem in human limb development is not outgrowth, but locating the point of outgrowth on the body wall. Little is known about the actual mechanism of placing the "presumptive limb field" along the body wall, but it may be related to TBX5 expression in the lateral plate mesoderm. HOXC6 is also expressed in the mesoderm limb primordium before any morphologic changes occur. A tumor suppressor related transcription factor (p63) may allow mesodermal-ectodermal interaction and induction. The somites also may participate in determination of the limb field. Although the presumptive field of outgrowth cannot otherwise be distinguished morphologically, experiments demonstrate that much has already occurred before limb outgrowth actually takes place. Even at this early stage, the ectoderm and mesenchyme interact, setting the stage for outgrowth. The ectoderm of the imaginal field may already be committed to the formation of the AER through the transient expression of FGF. Dorsoventral polarization is already established before limb bud projection, perhaps through dorsalizing influences of the somites and ventralizing influences of the lateral somatopleure. The limb bud develops in the Wolff crest, a ring of thickened ectoderm. The mesoderm is believed to be the prime mover. Experiments that removed the mesoderm produced no limbs, while experiments that transplanted the mesoderm resulted in ectopic limbs. The ectoderm and mesoderm form a highly regulated primordium, which displays the characteristics of a cleaving embryo. If a portion is removed, the primordium reorganizes to form an entire limb. If the imaginal fields are juxtaposed, superimposed, or disaggregated, they also reorganize to form one complete limb. However, if it is split and a barrier is placed between the 2 halves, 2 limbs form. The first outgrowth of the limb bud occurs with ectodermal expression of FGF8.HOXB6 expression is also involved. As the bud grows, the original overlying ectoderm becomes the AER, and both dorsal and ventral polarized mesoderm is recruited for outgrowth. Once initiated, outgrowth of the limb bud to limb completion is a function of the PZ (the undifferentiated, dividing mesenchyme). The PZ underlies and is influenced by the AER. As always, ectoderm and mesenchyme interact and maintain each other. This functional, self-sustaining loop is an important mechanism that is repeatedly employed in the process of limb development. In this case, the ectodermal AER is linked to the mesenchymal zone of polarizing activity (ZPA). This feedback loop involves sonic hedgehog expression by the ZPA and FGF4 expression by the AER. Without the ZPA, the AER degenerates, and vice versa. The AER, in turn, promotes outgrowth by maintaining the proliferative zone in an undifferentiated and proliferative state. If the AER is removed, the limb is truncated at a level corresponding to the age of the AER removed. FGF2 and FGF4 can sustain limb outgrowth. Initial positioning of the AER within the presumptive limb field is tied to dorsoventral polarization as discussed below (see Dorsoventral axis). As the limb grows, 3 axes are established: anteroposterior, dorsoventral, and proximodistal. Transplantation experiments with chicks established the existence of a small area located in the base of the posterior limb that, when transposed to the anterior margin, resulted in an extra mirror image limb structure with posterior digits along the leading edge. This zone, the ZPA, is believed to be responsible for polarization along the anteroposterior axis. This axis was along the plane of the fingers, with the little finger posterior and the thumb anterior. Retinoic acid beads mimicked the results of the ZPA transplantation experiments, causing the development of a mirror image limb. Therefore, the polarizing effect was postulated to fit a morphogen model of tissue induction. The ZPA may express a diffusable morphogen that polarizes cells along a concentration gradient. In this model, high concentrations of the morphogen (a retinoic acid analogue) signal for posterior polarization and the development of appropriate posterior digits, while low concentrations signal for anterior position and structures. Retinoic acid is found in high concentrations in the posterior portion of the chick wing. Retinoic binding proteins and receptors are also located here, implicating a role for retinoic acid in anteroposterior polarization. The morphogen theory demonstrates how individual cells may be exposed and even imprinted with position information (in this case, a point along a concentration gradient). The positional information theory is used to explain how cells identify their position and then appropriately differentiate into the definitive shape and function of the extremity. In classic descriptions, dorsoventral polarization has been attributed to the dorsal ectoderm. When an ectodermal jacket is transposed from a left-sided limb bud to a right-sided mesenchyme, a limb grows with left-sided dorsoventral polarity. In addition, when an AER is placed on a purely dorsal side of a bud, the resulting outgrowth has a jacket of 2 dorsal surfaces; when it is placed on a purely ventral side of a bud, the resulting outgrowth has a jacket of 2 ventral surfaces. The current model states that dorsal ectoderm expresses WNT7A, which induces mesodermal LMX1B, instituting polarization of the mesenchyme. Ventral ectoderm expresses EN1, which suppresses WNT7A expression, thereby allowing the default ventral phenotype to develop. Dorsoventral polarization may begin within the presumptive limb field before outgrowth. Opposition of dorsalizing signals of the somites and ventralizing signals of the lateral somatopleure may polarize limb field ectoderm. As limb outgrowth recruits this ectoderm, the underlying mesenchyme, in turn, is polarized via WNT7A, LMX1, and EN1. In addition, localization of the AER is tied to dorsoventral polarization, as the AER occurs at the border of dorsal and ventral cells. The AER develops at the border of radical fringe (RFNG)–expressing and non– RFNG -expressing cells. Also, in addition to its role in suppressing dorsalizing WNT7A,EN1 may be involved in limiting the ventral border of the AER. The last axis, the proximodistal axis, is believed to be defined as a function of outgrowth and the PZ. As development proceeds down the limb, cells leave the PZ and differentiate into appropriate mesenchymal structures (skeleton, connective tissue, vessels). The gene MSX1 (formerly known as HOX7) may be involved in keeping the PZ cells undifferentiated. The cells leaving the PZ may, in a sense, be polarized in the proximodistal axis by dwelling time within the PZ or the number of mitoses undergone. Lastly, the process of apoptosis (programmed cell death) is involved in the development of the upper limb. This process occurs in the interdigital spaces, the axillary fold, within joint spaces, and in certain primitive embryonic muscle layers. Sculpting of the hand is a complex, poorly understood process. The outgrowing limb flattens into a hand plate capped by the AER. The number of digits that develop is proportional to the length of the AER. In the past, the breakup of the AER was believed to initiate interdigital clefting; but now, the process appears to be primarily a function of the interdigital mesoderm within the interdigital necrosis zones. The tissues of the skeletal system are the first major tissues to show overt differentiation in the developing upper limb. As cells migrate from the PZ, they become differentiated mesodermal cells and undergo the process of chondrogenesis discussed in more detail below. Differential growth after migration from the PZ determines the ultimate size of the skeletal element fashioned. This growth may occur in accordance with positional information. In the fourth week, these cells condense proximally to distally to form a centrally located blastema. Ectoderm has an inhibitory effect on cartilage formation, which may help explain the central location of the blastema. In the fifth week, chondrification occurs proximally. Chondrification of the blastema then proceeds distally, reaching the phalanges in the sixth week. The sesamoids chondrify in the seventh week. As chondrification occurs, the central diaphyseal cells hypertrophy, radially compressing the surrounding mesenchymal cells, which condense into the periosteum and perichondrium. Matrix secretion aids in this process. Radial growth becomes restricted, but longitudinal growth remains uninhibited. The process of compaction does not occur in the epiphysis, perhaps explaining the enlarged diameter in this area. By day 48, all of the skeletal cartilaginous models except the terminal phalanges are in place. Ossification begins in the periosteal collars within the central areas of the cartilaginous models destined to become tubular bones. It is initiated in the humerus and shoulder girdle at day 38-40. The process proceeds distally, reaching the radius and ulna in the seventh week and the metacarpals and distal phalanges in the eighth week. The proximal and middle phalanxes begin to ossify at the 11th week. The earliest sign of joint formation is dense cellular areas without hypertrophy within the blastema from the fifth to sixth weeks. These areas are referred to as the interzones. Capsular structures condense from the surrounding mesenchyme before actual joint cavitation. Large joint formation begins at the seventh week, with the condensation of the 2 dense plates within the interzone separated by a layer continuous with the synovium. These plates chondrify to form the articular surfaces of the joint. Subsequent cavitation occurs between the articular surfaces. Cavitation coincides with and is dependent on the development of muscular activity and movement. If no movement occurs, the space fills with fibrovascular tissue and subsequently forms cancellous bone. Formation of the wrist is a complex process. The distal radius is ossified at the sixth week. At first, the lunate lies between the radius and ulna. Differential growth removes it from this position while extracting the distal ulna from the early wrist joint. The triangular fibrocartilaginous complex is formed simultaneously. Fusion of the centrale ulnare distale and the centrale radiale distale forms the scaphoid at the seventh week. Only the trapezium, trapezoid, and capitate arise from the blastema in their distinctive mature geometries. In order to fashion a digit (or any bone/cartilage/ligament of the body), the actual tissue (bone, cartilage, etc) must first be made (chondrogenesis) and then be "sculpted" through final differentiation and morphogenesis. Regulation of the formation of the cartilaginous anlage is attributed to three primary factors: (1) chondrogenic triggering signals (transforming growth factor betas [TGFbs], Activins, and bone morphogenetic proteins [BMPs]  ); (2) cartilage identity genes (group E Sox genes, etc); and (3) chondrogenic extracellular matrix. The matrix forms a scaffold for chondrogenic aggregation of cells but also seems to regulate local delivery of chondrogenic triggering signals in precise concentrations and temporal relationships. In order to focus on molecular relationships, Montero and Hurle identify a zone beneath the AER and progress zone (PZ) conceptualized as a "distal aggregating region," in which exists a zone of early differentiation and a more proximal region of later differentiation resulting in a segmented digital ray. The idea is that cells proliferating in the progress zone leave it and follow one of two pathways: incorporation into the growing ray cartilage or apoptosis. The distal aggregating region is where differentiation into the ray cartilage occurs. The earliest step in chondrogenesis is condensation of the undifferentiated mesenchymal cells into aggregates. TGFbs and Activins may play redundant signaling pathways specific for triggering chondrogenesis of the rays (rather than unspecific chondrogenic signaling). This process involves upregulation of ALK6 (BmpRIb), which seems to be the main chondrogenic receptor for the limb bud as it is expressed in the prechondrogenic aggregates of all limb skeletal elements. BMPs have opposite growth-promoting and apoptic effects, which probably depend on the finely tuned local expression of different receptors. They exhibit well-defined expression domains in the developing digits but not at the tip, except for GDF5. Combinations of BMPs are differentially implicated in the distinct skeletal elements of the limb. Extracellular matrix has a central role in chondrogenesis. At first, it acts as a scaffold for aggregation. It probably also effects the local delivery of growth factors, both in terms timing and in terms of concentration differentials. Components of the ECM are themselves differentially concentrated within the developing ray. For instance, the proteoglycan Syndecan-3 is highly expressed in prechondrogenic aggregation restricted to the perichondrium and the developing joints (after differentiation). Components of the ECM include fibronectin, proteoglycans, tenascin, elastin, fibrillins, etc. Of interest, severe disorganization of the interdigital scaffold of elastin and fibrillin precedes the induction of ectopic digits. Myogenic mesodermal cells originate in the somites. They migrate from the somites at approximately the fourth week. These cells do not appear to be guided intrinsically, but probably follow the lead of connective tissue. They express extracellular fibrils that allow them to interact with the extracellular matrix. These cells coalesce into 2 common muscle masses, one ventral and one dorsal. The myoblasts grow by hypertrophy and fuse into myotubules. The common muscle masses then split to fashion the definitive muscles. Every muscle is identifiable by 7 weeks. The muscles differentiate from superficial to deep. First, the flexor digitorum profundus, flexor carpi radialis, and flexor carpi ulnaris split off, followed by the flexor pollicis longus. The flexor digitorum superficialis originates from a superficial palmar blastema and thus ascends the arm. The palmaris longus ascends only after it has reached its origin. Cell death is involved in shaping the definitive musculature. Viable muscle requires innervation. Tendons develop independently and are derived from limb bud mesoderm rather than from somites. In fact, tendons develop in the absence of muscle, but they disintegrate later. The intrinsic muscles of the hand arise from 5 embryonic layers: the interossei dorsalis accessorii, intermetacarpals, flexoris breves profundi, contrahentes, and lumbricals. Initially, a common blastema divides into superficial and deep layers. Interossei and a contrahentes muscle are formed from the deep layer. The contrahentes recedes from the ulnar half of the hand in weeks 7-9 to become the adductor pollicis. The second, third, and fourth dorsal interossei develop from the fusion of 3 layers: the interossei dorsalis accessorii, intermetacarpals, and flexoris brevis profundi. This pattern is unique to the human hand. In association with the tendons and synovial sheath, the pulley system has been recognized by week 9 as condensing mesenchyme. The pulleys are well-developed by week 12. Motor nerve outgrowth from the spinal cord occurs in an orderly fashion around the third week. Nerves from the medial cord grow to innervate the ventral muscle mass, while those of the dorsal cord supply the dorsal mass. In general, the craniocaudal origin of the nerves also correlates with an anteroposterior axis of final innervation; the nerves that are most rostral supply the muscles that are most anterior. By the fourth week, these motor nerves reach the brachial plexus, where they mix and enter the limb by the fifth week. The process by which the nerves make their way to the target cells is not fully known. The nerve trunks advance with a roughed leading edge termed the pioneer growth cone. The filopodia of the growth cone allow for close contact with the mesenchymal cells, which may act as signaling cells for guidance. Motor nerves are not guided by their target muscles, nor are they guided by matrix fibrils as are muscle cells. Manipulating the position of the target muscle does not alter the nerve's ability to locate it. Ventral axonal attraction may be mediated by the binding of chemoattractants, termed netrins, to an axonal receptor encoded by DCC. Ultimately, contact with a target muscle is necessary for survival of the nerve. Nerve cell death then adjusts the number of nerves to the target size. Sensory cells are derived from the neural crest and follow the motor cells for guidance. A nascent network of capillaries coalesces from hemangioblastic stem cells in the limb mesenchyme to form a submarginal vein beneath the AER in the third week. This vein is connected to the cardinal vein. Branching from the aorta establishes a central brachial artery axis that then extends into a dominant medial artery. This axis also produces the interosseous artery. At 6 weeks (14-mm embryo), the ulnar artery branches from the brachial artery and reaches the palm by the 16-mm stage. The radial artery branches from the axis last, at the 17- to 18-mm stage. Once the radial artery is established, the median and interosseous arteries regress. The digital arteries arise from capillary networks that regress and split during the process of clefting, such that each border of the resultant interspace contains a digital vessel; this is of clinical significance. In syndactyly, regression of the network does not fully occur, which can result in variable complex vascular patterns in the residual interspace web. Al-Qattan MM, Kozin SH. Update on embryology of the upper limb. J Hand Surg Am. 2013 Sep. 38(9):1835-44. [Medline]. Seyfer AE, Wind G, Martin RR. Study of upper extremity growth and development using human embryos and computer-reconstructed models. J Hand Surg [Am]. 1989 Nov. 14(6):927-32. [Medline]. Tickle C. Embryology. Gupta A, Kay SPJ, Scheker LR. The Growing Hand: Diagnosis and Management of the Upper Extremity in Children. First ed. London, UK: Mosby; 2000. 25-32. Tiktaalik roseae. University of Chicago Web site. Available at http://tiktaalik.uchicago.edu/. Accessed: October 3, 2008. Man LX, Chang B. Maternal cigarette smoking during pregnancy increases the risk of having a child with a congenital digital anomaly. Plast Reconstr Surg. 2006. 117:301-8. [Medline]. Lorda-Diez CI, Montero JA, Garcia-Porrero JA, Hurle JM. Interdigital tissue regression in the developing limb of vertebrates. Int J Dev Biol. 2015. 59 (1-3):55-62. [Medline]. [Full Text]. Montero JA, Hurlé JM. Deconstructing digit chondrogenesis. Bioessays. 2007 Aug. 29(8):725-37. [Medline]. Guo B, Lee SK, Paksima N. Polydactyly: a review. Bull Hosp Jt Dis (2013). 2013. 71(1):17-23. [Medline]. Beatty E. Upper limb tissue differentiation in the human embryo. Gupta A, Kay SPJ, Scheker LR. The Growing Hand: Diagnosis and Management of the Upper Extremity in Children. First ed. London, UK: Mosby; 2000. 33-8. Brunet LJ, McMahon JA, McMahon AP, Harland RM. Noggin, cartilage morphogenesis, and joint formation in the mammalian skeleton. Science. 1998 May 29. 280(5368):1455-7. [Medline]. Bumcrot DA, McMahon AP. Sonic hedgehog: making the gradient. Chem Biol. 1996 Jan. 3(1):13-6. [Medline]. Carlson BM. Human Embryology and Developmental Biology. St. Louis, Mo: Mosby-Year Book; 1994. Chuang PT, McMahon AP. Vertebrate Hedgehog signalling modulated by induction of a Hedgehog- binding protein. Nature. 1999 Feb 18. 397(6720):617-21. [Medline]. Cygan JA, Johnson RL, McMahon AP. Novel regulatory interactions revealed by studies of murine limb pattern in Wnt-7a and En-1 mutants. Development. 1997 Dec. 124(24):5021-32. [Medline]. Gardiner DM, Bryant SV. Molecular mechanisms in the control of limb regeneration: the role of homeobox genes. Int J Dev Biol. 1996 Aug. 40(4):797-805. [Medline]. Hammerschmidt M, Brook A, McMahon AP. The world according to hedgehog. Trends Genet. 1997 Jan. 13(1):14-21. [Medline]. Hampton T. Prenatal smoking linked to digit defects. JAMA. 2006. 295:879. [Medline]. Herault Y, Beckers J, Gerard M, Duboule D. Hox gene expression in limbs: colinearity by opposite regulatory controls. Dev Biol. 1999 Apr 1. 208(1):157-65. [Medline]. Herault Y, Hraba-Renevey S, van der Hoeven F, Duboule D. Function of the Evx-2 gene in the morphogenesis of vertebrate limbs. EMBO J. 1996 Dec 2. 15(23):6727-38. [Medline]. Huang F. Syntagms in development and evolution. Int J Dev Biol. 1998. 42(3 Spec No):487-94. [Medline]. Kondo T, Herault Y, Zakany J, Duboule D. Genetic control of murine limb morphogenesis: relationships with human syndromes and evolutionary relevance. Mol Cell Endocrinol. 1998 May 25. 140(1-2):3-8. [Medline]. Linscheid RL. Evolution of the human hand. Gupta A, Kay SPJ, Scheker LR. The Growing Hand: Diagnosis and Management of the Upper Extremity in Children. First ed. London, UK: Mosby; 2000. 1-4. Moore KL, Persaud TVN. The limbs. The Developing Human: Clinically Oriented Embryology. 5th ed. Philadelphia, Pa: WB Saunders; 1993. 375-83. Morata G, Sanchez-Herrero E. Patterning mechanisms in the body trunk and the appendages of Drosophila. Development. 1999 Jul. 126(13):2823-8. [Medline]. Oberg KC, Greer LF, Naruse T. Embryology of the Upper Limb: The molecular orchestration of morphogenesis. Handchir Mikrochir Plast Chir. 2004. 36:98-107. [Medline]. Reddi AH. Developmental skeletogenesis. Gupta A, Kay SPJ, Scheker LR. The Growing Hand: Diagnosis and Management of the Upper Extremity in Children. First ed. London, UK: Mosby; 2000. 39-45. Riddle RD, Tabin C. How limbs develop. Sci Am. 1999 Feb. 280(2):74-9. [Medline]. Sadler TW, ed. Langman's Medical Embryology. 7th ed. Baltimore, Md: Williams & Wilkins; 1995. Shubin N, Tabin C, Carroll S. Fossils, genes and the evolution of animal limbs. Nature. 1997 Aug 14. 388(6643):639-48. [Medline]. Simon H. T-box genes and the formation of vertebrate forelimb- and hindlimb specific pattern. Cell Tissue Res. 1999 Apr. 296(1):57-66. [Medline]. Simon HG, Kittappa R, Khan PA, Tsilfidis C, Liversage RA, Oppenheimer S. A novel family of T-box genes in urodele amphibian limb development and regeneration: candidate genes involved in vertebrate forelimb/hindlimb patterning. Development. 1997 Apr. 124(7):1355-66. [Medline]. van der Hoeven F, Sordino P, Fraudeau N, et al. Teleost HoxD and HoxA genes: comparison with tetrapods and functional evolution of the HOXD complex. Mech Dev. 1996 Jan. 54(1):9-21. [Medline]. Yamaguchi TP, Bradley A, McMahon AP, Jones S. A Wnt5a pathway underlies outgrowth of multiple structures in the vertebrate embryo. Development. 1999 Mar. 126(6):1211-23. [Medline]. Zakany J, Duboule D. Synpolydactyly in mice with a targeted deficiency in the HoxD complex. Nature. 1996 Nov 7. 384(6604):69-71. [Medline]. Zuniga A, Haramis AP, McMahon AP, Zeller R. Signal relay by BMP antagonism controls the SHH/FGF4 feedback loop in vertebrate limb buds. Nature. 1999 Oct 7. 401(6753):598-602. [Medline]. The authors and editors of eMedicine gratefully acknowledge the contributions of previous author Joel P Maier, MD, to the development and writing of this article.